There are numerous real estate sites and portals designed to help buyers find the perfect property. There have been few service offered with sellers in mind. ... sellers need all the help they can get. Today, the Real Estate Marketing Report Card (REMRC) is being launched in an effort to help sellers monitor their online reach. Rather than having to rely on an agents word that the property information has been placed on the Web, sellers can now easily check for themselves and make sure they're getting the best bang for their buck. 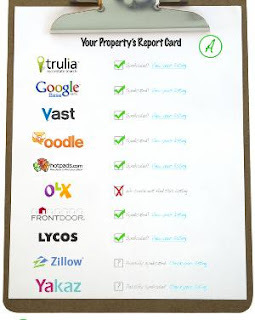 REMRC searches across the Web and looks a a variety of real estate portals including Trulia, Google Base, Vast, Zillow and FrontDoor for details on where the property is listed. The results appear as a grade; getting an A means your property has decent exposure on the Web; a D means you need to take some action. In addition to the grade, the site will provide a link to your listing on the various sites so you can see how well or how poorly your property is represented.